Oahu, the third largest island in Hawaii, is known as the “gathering place”. The majority of Hawaii’s residents live on Oahu and hundreds of thousands of tourists visit the island every year. In no specific order, here are 8 things that all Oahu visitors should do on the island. This string of several beaches dotting the island’s southwest coastline is the go-to spot because of its soft, creamy sand and the beautiful waves that lap the shores during the winter. 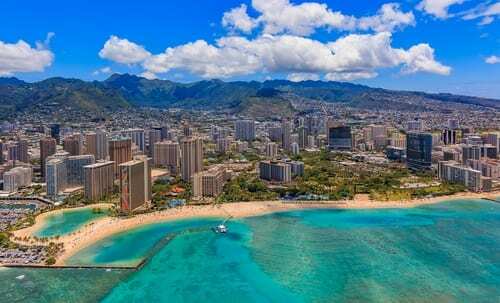 You don’t have to be a surfer to appreciate Waikiki Beach, though; just lie back on a beach towel, relax and gaze up at the majestic Diamond Head State Monument in the distance. 15 miles northeast of downtown Honolulu you will find two of the best beaches on Oahu. (Lanikai and Kailua). Lanikai is tranquil, with calm waters and a mile of white sands. This family-friendly beach is also within view of the Mokulua Islands, a haven for kayaking and surfing. Kailua is a 3-mile stretch of white, shaded sand and warm, turquoise-hued water that appeals to both families and adrenaline junkies thanks to its gentle waves and large grounds. Grounds include picnic tables, restrooms and free parking. This unique crater was created 300,000 years ago during a single volcanic eruption that spewed ash into the air. That ash settled over thousands of years, revealing the Diamond Head State Monument, which is one of the most recognizable features of Oahu’s skyline today. Diamon Head is also home to one of the island’s most scenic hiking trails. Manoa Falls is a 100-foot waterfall 5 miles from downtown Honolulu. Hike the 1.5-mile well-worn path through the rainforest to the falls. Many scenes from Jurassic Park were filmed here. Iolani Palace is a 10-room historic house and museum built in 1882. The museum details the reigns of King Kalakaua and his sister, Queen Liliuokalani, Hawaii’s final monarch.s It is the only official state royal residence in the US. The World War II Valor in the Pacific National Monument is home to the USS Arizona Memorial, which is the final resting place of 1,177 sailors killed during the Pearl Harbor attack. The sunken battleship is still visible from the memorial floating above it. Want to visit Oahu for yourself? Call us at 402-281-3022.